When you tell people that you cruise the Caribbean on your own sailboat...well you get some strange questions. Were there any malls?...No and we sure did not miss them. 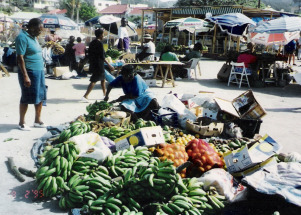 Here is the local farmers market on the island of Grenada... folks came from all over the island every Saturday morning for their food shopping for the week. It seemed that every island had similar markets, some with butchers, quite a few with fish vendors. The vast majority of our meals were prepared on board our boat...Venezuela, was an exception because it was so cheap to eat ashore. We never got sick from eating street food from vendors... one of our favorites was a chickpea creation wrapped in dough, called "doubles" in Trinidad. In Venezuela, they would squeeze you a glass of fresh orange juice... it took about 10 oranges per glass... for about $.25. Certain items were cost controlled in Venezuela gasoline or diesel is still around $.37 a gallon, a pound of ground coffee was $.80, a cup of espresso was $.10-$.20... and the local coffee was excellent. When sailboat cruisers went ashore we tended to avoid touristy places... the restaurants frequented by tourists staying at fancy resorts... in fact we generally had little contact with tourists with the exceptions of the ones that found their ways to watering holes that were frequented by the locals... that's where the sailboat cruisers went, where the locals went. Since there is no room for a car aboard a sailboat... although a few cruisers had bicycles... you did what the locals did for transportation. 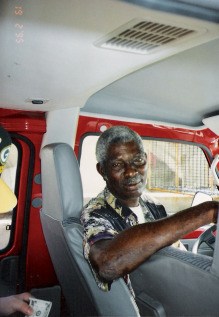 Here is a friendly driver that you will find in almost every island driving a 14 passenger van, they were called maxi-taxis, the maximum fare was a dollar...in Venezuela the bus fare was seven cents. Without fail when someone got into a maxi taxi, they always said good morning or good afternoon... we found the local islanders to be extremely polite and friendly. They seem to appreciate talking to sailboat cruisers, and giving us tips on their particular island... we found that the golden rule works almost anywhere. Since the locals had to go to the grocery store we found that almost every bus route would include a stop at the major shopping areas... we learned to take backpacks whenever we went shopping. Staying safe when you went ashore is basically the common sense that you would use anywhere in the USA. Travel together when you can, be careful when going out at night... and don't look like a tourist. This meant no jewelry or flashy clothes, or anything that would draw attention to you or make you stand out. 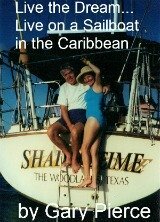 We never once encountered an uncomfortable situation, and never had anything stolen, either ashore or on our boat, in our entire eight years of sailboat cruising.